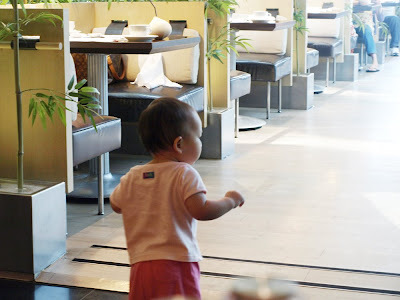 Here is the last batch of photos from our wonderful trip to Taipei. They are mainly miscellaneous photos of Natalie hanging out and "gow-gow-juhn". Videos to come soon! Natalie watching intently while I teach her put her hands against her face when I say "Oh no!" Natalie doing the "Oh no!" action. She's loves to mimic other people. Natalie watching the Olympics with her daddy on our big comfy king bed. Look how tanned they are. We went swimming every day. Natalie has scooted closer to lie like her daddy to watch TV. Not sure where Natalie learned to do this. Maybe she's been watching too much "Married with Children" or maybe her real name is Natalie Bundy. 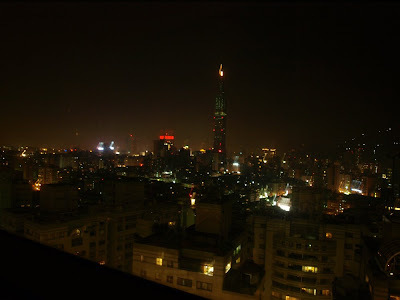 We turned off all the lights and Clark took this awesome shot (20 sec exposure) of the Taipei city at night. 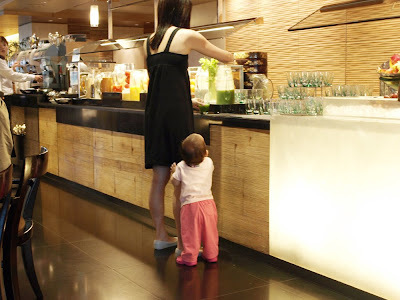 Natalie follows me to get some celery juice at the breakfast buffet. This is what I see from my angle. 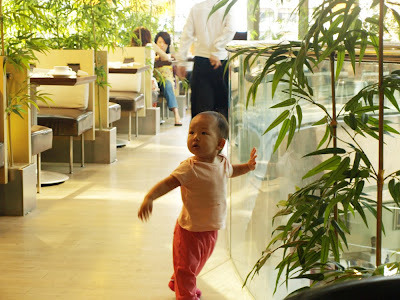 She's not afraid of heights at all and will slap the balcony glass and babble fearlessly. She wanders farther and farther away. She's becoming more and more independent (especially when happy with a full belly).